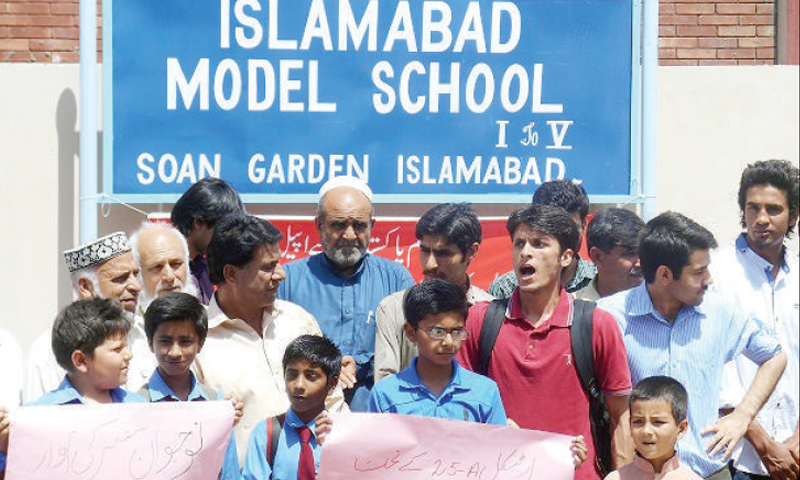 Residents of Soan Garden protest outside Islamabad Model School, seeking regular classes in the institution. Almost four years after the construction of the Islamabad Model School (Primary) (IMS) building in Soan Garden, the school has yet to be made functional due to a dispute between the Federal Directorate of Education (FDE) and the contractor. The school is the only government school available to a locality of almost 100,000. Due to the dispute, many local residents, most of whom belong to the lower middle class, have been left with no option but to send their children to private schools – which are significantly more expensive. Construction on the school began in 2008 and was completed in 2010. The building has 12 rooms and is worth Rs35 million. Following the building’s completion, the FDE refused to take possession from the contractor, claiming that there was a 50ft depression at the back side of the building, which required the construction of a 60ft Reinforced Concrete (RC) wall for the students’ safety. However the contractor said that he had constructed a six foot wall at the end of the plot and claimed that there was no need for an RC wall. Soan Gardens Housing Society Residents Welfare Association Patron-in-Chief Mohammad Mansha Sahi told Dawn that while local residents had been trying to get the school functioning since its construction, no one was taking the situation seriously. “The building has been completed, and a school principal and teachers have been deputed, but they only show up to mark attendance and they leave soon after,” Sahi said. The vice president of the residents’ association, Iftikhar Chaudhry, said that it was only after the society’s residents forced the management that a government school was constructed within the area. A six and a half kanal plot of land was given to the FDE free of cost. “The building is ready, but admission cannot begin due to the dispute between the FDE and the contractor. There are a number of private schools in the area, but they cost thousands of rupees. The residents want quality education at affordable prices, but for the last four years they have only heard assurances,” he said. Dilshad Ahmed, a resident, said that a principal, seven teachers and school staff had been hired, but they only come to the school for a few minutes every day and then leave. “Many residents send their children to model schools in I-8 and I-9. Most of them pick and drop their children, and some have arranged private transport – which is not very affordable,” he explained. He added that, “A private van charges around Rs2,500 a month per student, and it is not easy for five and ten year olds to travel 15 kilometres every day. The FDE has informed us that the primary school will be co-educational, so the majority of residents will send their children to the same school. It will also be easier for parents to pick and drop their children as the school will be a five minute walk from their houses,” he said. The school principal, Mumtaz Iftikhar, declined to comment and left after spending a half hour at the school. Haji Alauddin, an official from the non-government organisation (NGO) Iqra Ehsan Welfare Organisation, said that management of the housing society had converted plots for mosques, graveyards and parks, into residential and commercial plots. “The plot which was given to the FDE for the school is not being used for the welfare of the society. We have held protests in front of the building several times, but now we have no choice but to block the G.T. (Grand Trunk) Road because that is the only way the school will be made functional,” he said. An FDE official who requested to remain anonymous said that both the project’s contractor and FDE management are responsible for the delay. “Unfortunately, both parties have been playing a ‘blame game’. There is a mafia that is more interested in constructing buildings than making them functional as there is more commission in construction work,” he said. “Once the school opens it will become a liability because the FDE will have to arrange funds to run the school and pay wages. Commission cannot be received from that expenditure,” he added. Mehmood Lodhi, the contractor, said the FDE needs the commission due to which it is not ready to take possession of the school building. “I have invested almost all the money into the building and cannot pay commission. My family has been constructing schools for the last five decades; it is our family business – I see no fault in the building,” Lodhi said. In response to a question, Lodhi said that he cannot construct the RC wall as it requires funding. “The FDE has yet to pay me the final bill. Moreover, 10 per cent of the contract (Rs3.5 million), which was paid as security, has not been paid to me,” he added. “The building has 12 rooms. The bathrooms and water boring has also been completed, and payments have been made for electricity and gas but the FDE is still not ready to take possession,” he said. Capital Administration and Development Division (CADD) Joint Secretary Rafique Tahir told Dawn that he was aware of the situation and had visited the school. “The contractor will be asked to address all of the FDE’s objections during the summer vacation. In addition, a PC-IV will be submitted to the finance division for the creation of posts in the school – currently the principal and teachers have been sent to the school in a ‘stop gap’ arrangement,” he said.